WE FATHERS DON'T NORMALLY SEEK OUT ADVICE ON ALL THINGS DAD AND CHILD REARING. BUT, FINALLY THERE IS A PLACE FOR MOTHERS (AND NOW FATHERS) TO GO. CHECK OUT: MOMFILTER. Great pic! 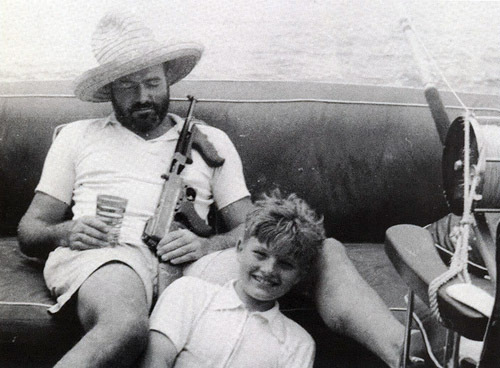 Is that Hemingway? I would love to know the caption. YES IT IS.. I BUDY EMAILED IT TO ME. You had me for a second with iBudy. I thought Steve Jobs had just outdone himself with a sweet app that mailed awesome pics to one's iPad. I did find a copy of the pic on someones blog associated with a June '35 Esquire article entitled "On Being Shot, Again". Pretty funny article, at least the parts I could find in the snippet view of google books, but I can't tell if the pic really matches up with the article.